The security checkpoints have changed a bit again at the Magic Kingdom … now everyone goes through the metal detectors, even if you’ve already had your bags checked. Our first FastPass was for Space Mountain, so that was our first ride after entering the park. 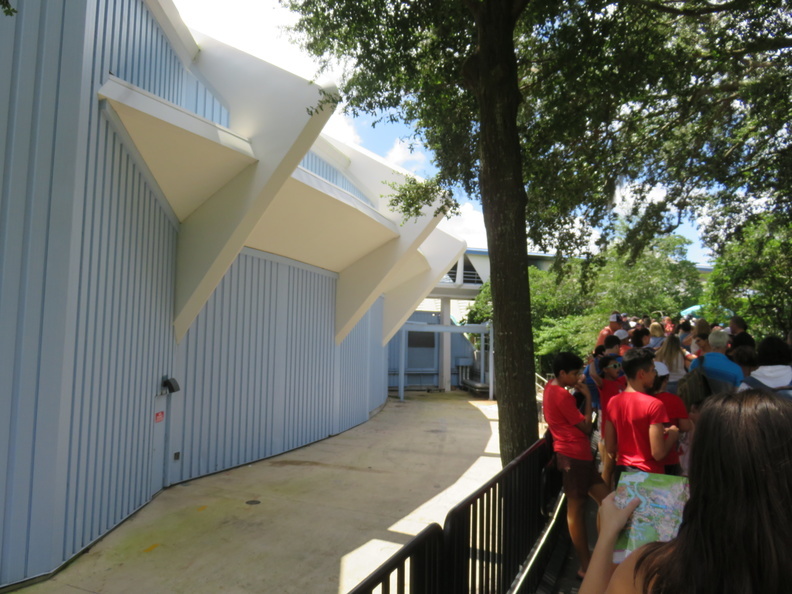 Apparently the exit tunnel is under construction as we ended up walking outside and around the back of the circular building that houses the coaster. Our other FastPasses were for the Seven Dwarfs Mine Train and Splash Mountain so we knocked those out in short order as well. In between, we went to the Country Bear Jamboree, which we hadn’t done in a while. 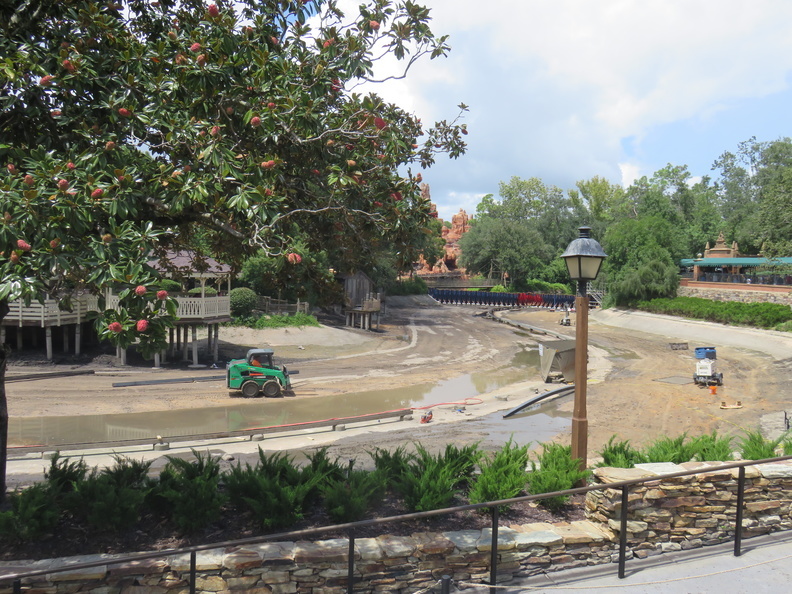 We also noticed some construction going on at the Liberty Square Riverboat: part of the river between Liberty Square and Tom Sawyer Island was actually drained and you could see the track! Very cool (I had no idea it was on a track). It was now mid-afternoon and time for lunch at the Food & Wine Festival over at Epcot so we hopped onto the monorail back to the ticket and transportation center and then transferred to the Epcot monorail. It’s annoying that even though you board the monorail at the T&TC behind security, you debark at Epcot and have to go through bag check/security again. I wish they could adjust that somehow. Anyway, by 3:30pm we were walking around the World Showcase and sampling the food (and alcohol) at the festival. We also managed to snag a FastPass for Soarin’ (front row, center car!) and then swung by the festival center to get our special Food & Wine Festival Passholder magnet. 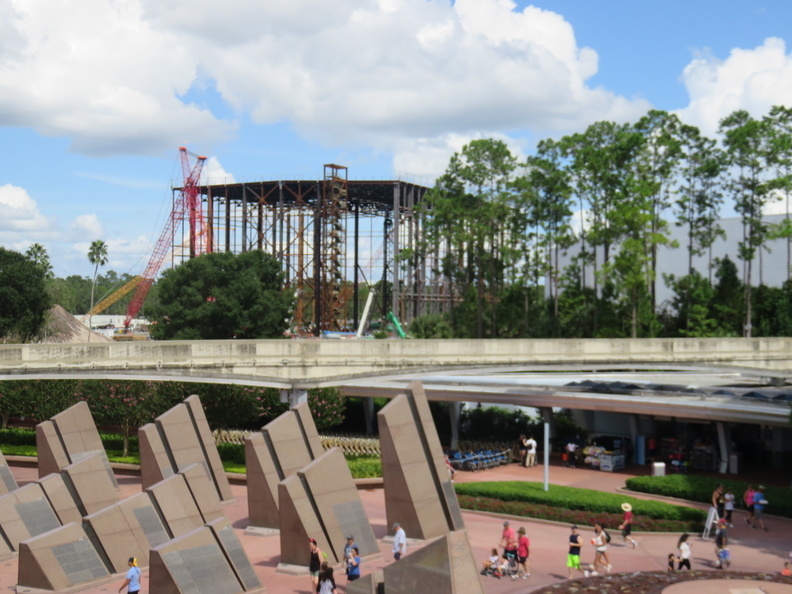 The Guardians of the Galaxy roller coaster construction is really progressing … the new building going up behind the old Ellen’s Energy Adventure ride is huge! (looking forward to that one opening). We still hadn’t received the text message letting us know our hotel room was ready, but it was 6:30pm and we were ready to check-in. We hopped on a bus at Epcot back to the Port Orleans Riverside and got checked into our room (turns out we didn’t get the text because my credit card number had changed since I made the original reservation … oops!). We spent some time unpacking and getting familiar with the resort before taking the boat over to Disney Springs for the evening. 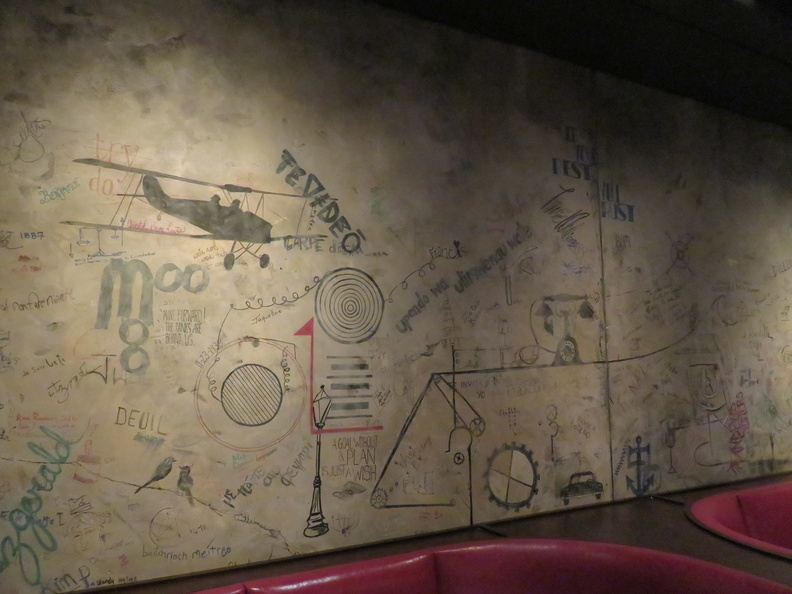 We had late dinner reservations at Enzo’s Hideaway, a cool tunnel bar/speakeasy (complete with Prohibition era-like grafitti on the walls). After a great dinner of Italian food, we did a little more shopping at Disney Springs and then took the boat back to our hotel. We were in bed shortly before midnight … quite the first day!